The haiku above encapsulates the trading method you’ll learn in this review. 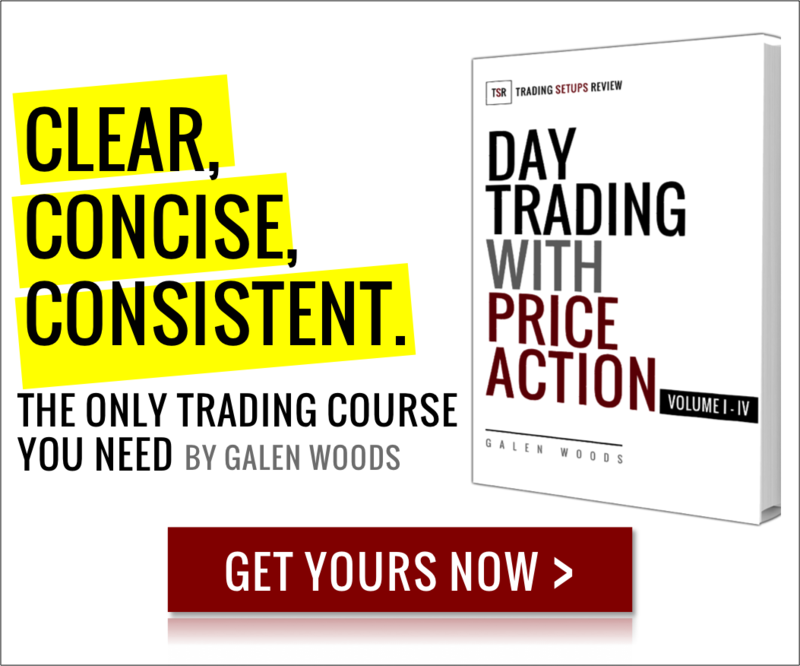 These trading strategies come from Felipe Tudela’s book – The Secret Code of Japanese Candlesticks. The Japanese names for these trading strategies are San Zan (triple top) and San Sen (triple bottom). These are two of the Sakata methods Felipe Tudela explored in his book. 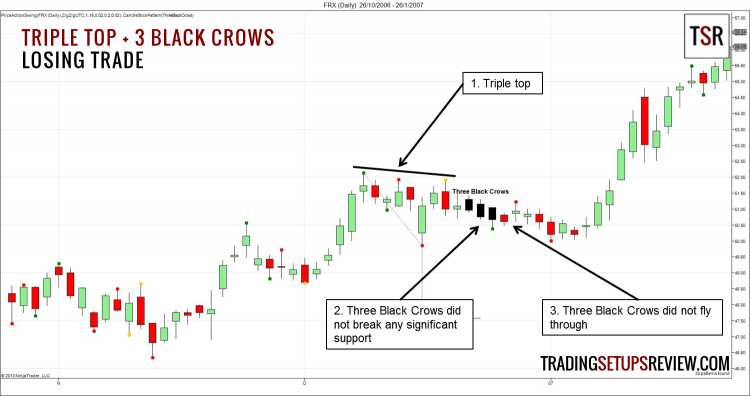 Other than the triple top and triple bottom chart formations, this candlestick trading strategy also uses two candlestick patterns: Three Black Crows and Three White Soldiers. For those unacquainted with this small flock of ominous black birds, the Three Black Crows candlestick pattern is a series of three consecutive bearish bars, each opening within the body of the previous bar. It is a downthrust that confirms the breakdown of prices. 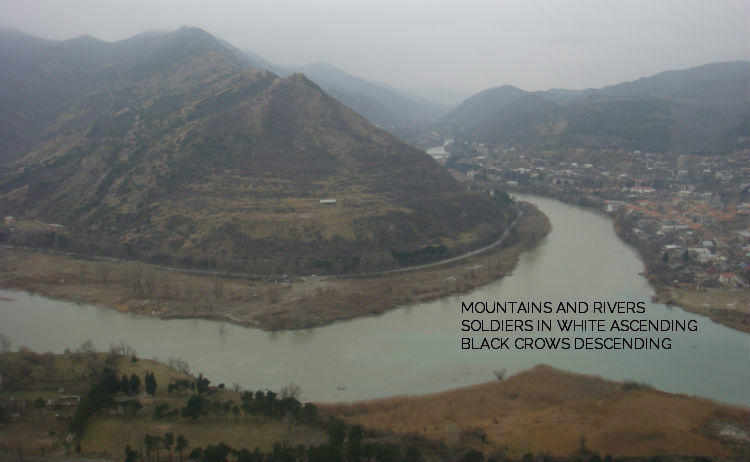 The fighting trio in white is the reverse of the Three Black Crows. In this daily chart of SanDisk Corporation, we used the San Sen method with the Three White Soldiers candlestick pattern to capture a dominant trend that lasted around two weeks. We found the triple bottom with a manual scan. 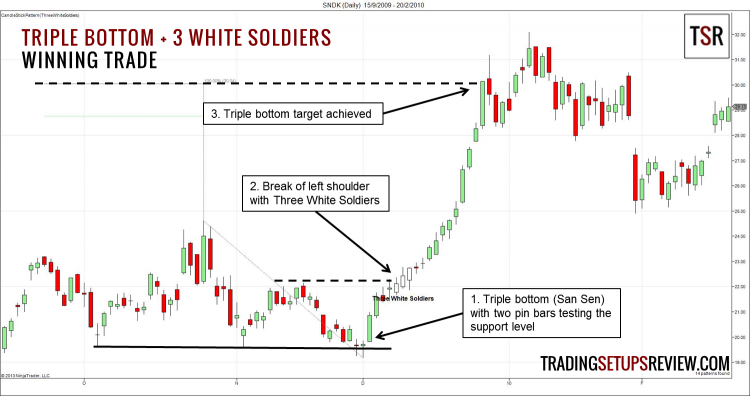 But for the Three White Soldiers patterns, you can use the candlestick indicator in the NinjaTrader software. A triple bottom tested by two bullish pin bars. This triple bottom was also a failed head and shoulders reversal formation. 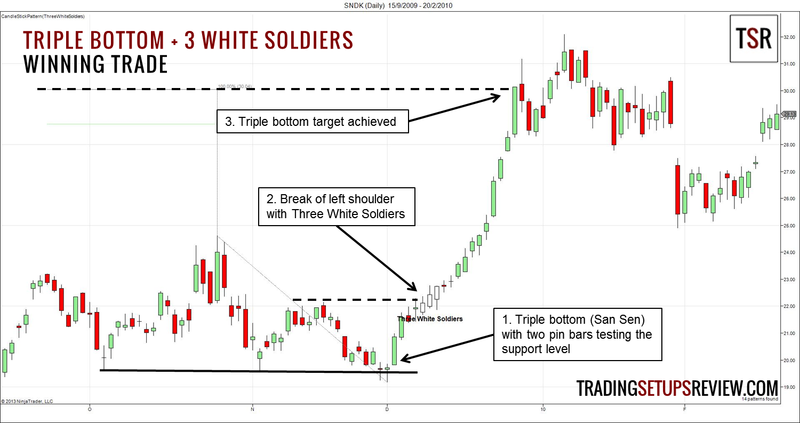 The Three White Soldiers candlestick pattern broke the left shoulder with fresh momentum. Prices moved up strong. The market hit the target price based on the triple bottom before stalling and moving sideways. This chart of Forest Laboratories Inc shows a Three Black Crows candlestick pattern failing, despite a well-defined triple top preceding it. Let’s take a closer look to see why the crows did not fly through. A clear triple top, but it was a small formation lasting only around ten days. Compare this to the triple bottom in the winning trade example. The ideal Three Black Crows candlestick pattern is a breakdown of the market. However, in this case, the Three Black Crows did not break any significant support levels. Hence, the bearishness was in doubt. The lack of follow-through for the Three Black Crows pattern hinted at its eventual failure. This price action trading strategy is just a particular variant of the Sakata methods. Essentially, the Sakata methods combine a more extensive chart formation with a suitable candlestick pattern. Hence, the Sakata methods force candlestick traders to consider the market context for each trade. To learn more about Sakata methods, you should refer to Felipe Tudela’s book which explains the other Sakata methods in detail with more than 30 examples. In trading, getting the market context right is more important than pinpointing the entry. As the Sakata method focuses on the context and market phase, once you get that right, you can use a variety of candlestick patterns to enter the trade. You need not wait for a perfect Three Black Crows or Three White Soldiers candlestick pattern; any three consecutive bearish or bullish bars will do just as well. This flexibility is necessary for day traders as the Three Black Crows and Three White Soldiers patterns rarely occur in intraday time frames. However, as compared to using a moving average to analyze the market context when trading candlesticks, the Sakata methods are more subjective. You’ll need to exercise discretion to identify the chart formations (like the triple tops/bottoms) that work. As seen in the examples above, chart formations that last longer tend to perform better and provide reliable targets to exit your trades. In all, the San Sen and San Zan methods are great additions to any candlestick trading approach. Now, go forth and trade like Homma Munehisa, the father of candlestick charting. Thank you for your kind comments! Please join our mailing list for updates of new trading articles.